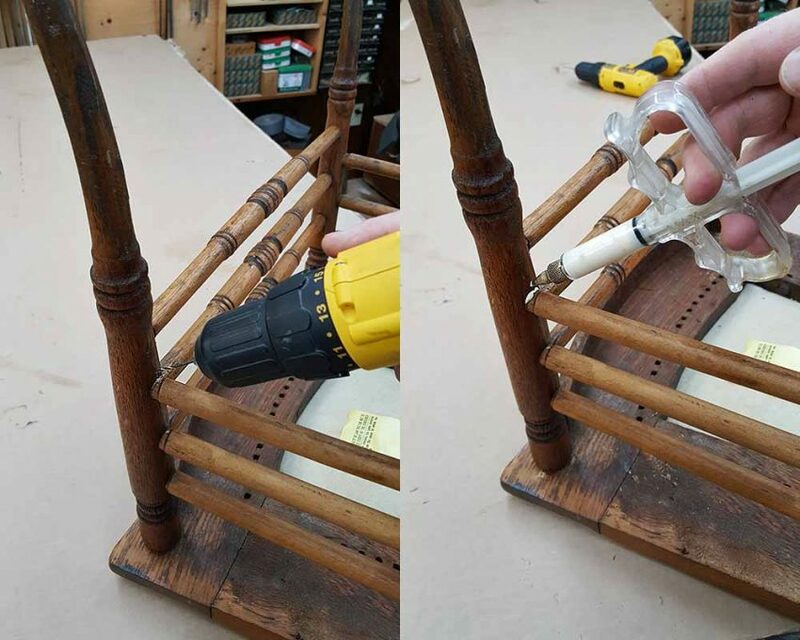 Re-gluing a loose and wobbly chair can be done two ways. Either disassemble it and re-glue complete, or work glue into the joints without taking it apart. Which method is best is determined during inspection. However a key step to both, is using clamps to pull everything tight until the glue is dry. Here’s a closer look at these two techniques. With the use of a rubber mallet, some chairs can be taken apart. This method is preferred because the old glue can be scraped off the connecting joinery. New glue is then applied, the chair is re-assembled, and clamped tight. Tip – when disassembling a chair, it’s important to lay out the parts in such a way that everything will be put back together as was. Mixing up stretchers, or even turning parts the wrong way will cause problems when putting the chair back together. In many cases a chair can not be disassembled without creating damage. 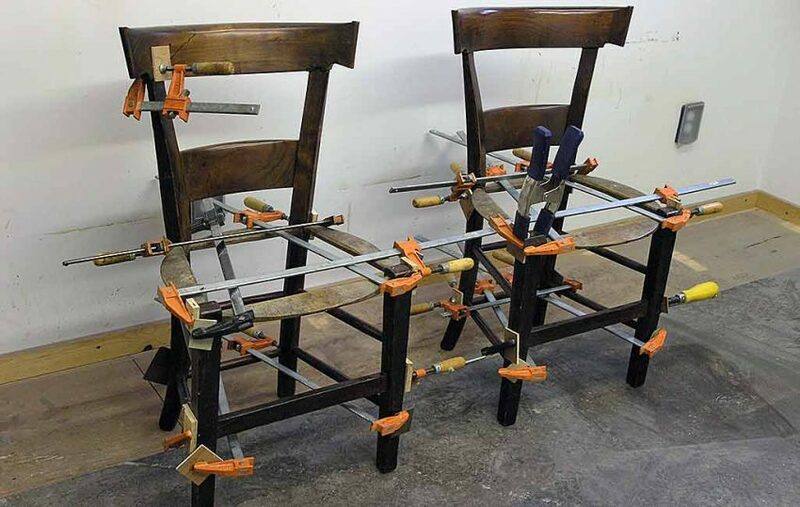 Or perhaps the joints are pegged, or the chair is upholstered. For these situations it is best to use a glue injector to work glue into the loose joints. To do this, an 1/8” hole is drilled into the cavity of the loose joint. Glue is then injected into the hole until it comes out the seam of the joint. The hole is then plugged, and the chair is clamped tight. Tip – placement of the hole is usually underneath the chair so it won’t be seen afterwards.